I started a new Bible study this afternoon at church. 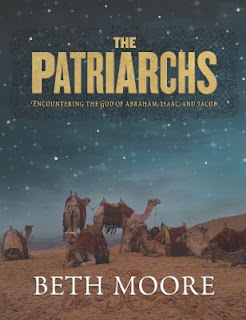 It's "The Patriarchs" by Beth Moore. I am super excited about it. First of all - I LOVE Beth. (who doesn't?) and second - I have been studying Genesis lately and I love reading the stories about Abraham, Jacob and Joseph which is what this study is all about. I will get a lot of knowledge and depth that I wouldn't get on my own. Plus my friends Kacy, Elizabeth and Ashley are all in it with me which makes it fun. Tonight was an exciting night because we had new deacons ordained in the service and three were guys from our Sunday School class including our dear friend Steve. We are so proud of all of them and their service to God and our church! Katie and I did that study a while back! It is HANDS DOWN the best I've ever done, so much so that I want to do it again. Beth is so knowledgable. It is amazing how many things in the Old Testament were written with relevance to New Testament life. You will love it! You didn't tell me when I talk to you about Steve being ordained as a deacon. I am so proud of him! Laurie, when you read this, please let Steve know we are so pleased and know God will use him greatly! Blessings to you both! Great picture of the both of you also! I just discovered your wonderful, fun and inspiring blog. I enjoyed browsing through your posts, hearing of your love for the Lord and how He is working in your life:) I am a follower of Jesus too... I love Him and love spending time with women and helping and encouraging their walks. I'll be leading a Beth Moore study that's starting up this week! I'm a pastor's wife, and have three great kids (24, 21, and 20). Just wanted to say hello and to thank you for reflecting Jesus... even through a blog! Oh loved the Patriachs! I just recently started Beth Moore's Daniel and can't put it down. You will LOVE this study! I'll be praying for you. It will bless your socks off. Have a great week. And, I love the old house. Very cool. This is my favorite BM study! I loved it! That's a great picture of Laurie and Steve! Enjoy- you will get so much from it! Oh, you will LOVE the Patriarchs. She makes all of the people in the study become so alive and real. I'm jealous. I wish I was in that study with you! That's wonderful about Laurie's husband, and what a great picture! I LOVE Beth Moore, also. I went to a conference once and it was absolutely GREAT! That is a good picture of them! What great people. Yes...loved doing the Patriarchs. It was a life-changing study. My mom gave me a Beth Moore book when McCoy was born! I love it! Also, I am obsessed with old houses. I just love all the character they have! You just wonder if there would be a lot of fix-up, but it might be worth it! You'll have to keep us updated on how the Bible study is going. From all of the endorsements here, I am intrigued. Congrats to your friends. What a special day for them. I just moved from Genesis to Exodus. It's neat that we were both reading that!